We got there at about 12pm, when everything was unnervingly calm... Mr Hungry Hoss was limbering up for his big moment as superstar DJ and wing polisher extraordinaire, and the staff were firing up the Inka grill. It wasn't long until we gave in to the smokey calling. It was Big Mancs, Parmos and Party Burgers all round, with a couple of rounds of fries thrown in for good measure. The 'Twelve Dollar' shake was pretty good too. This was a healthy mix of vanilla infused bourbon, Kahlua, double cream, Amaretto and crushed ice. It was a bit like a cake in a glass... I loved it. 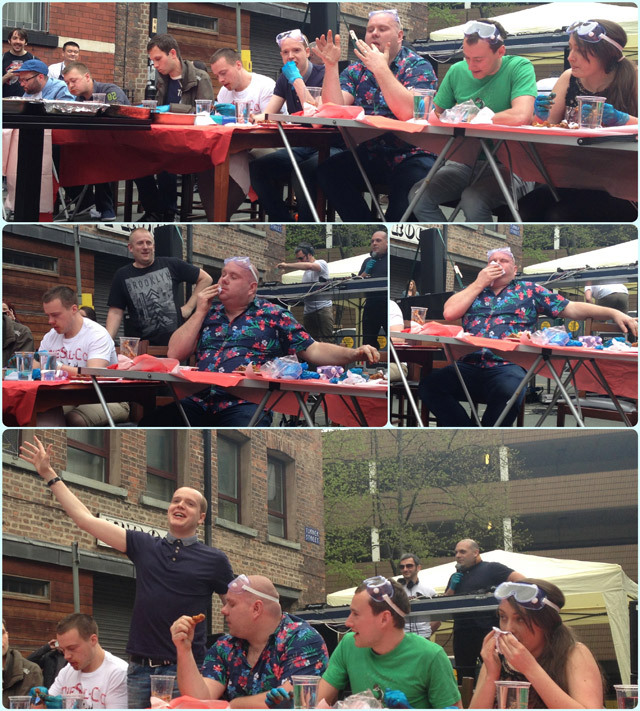 Our friend Kev was taking part in the hot wing challenge, so was suitably 'focused' until the festivities began at 2pm. 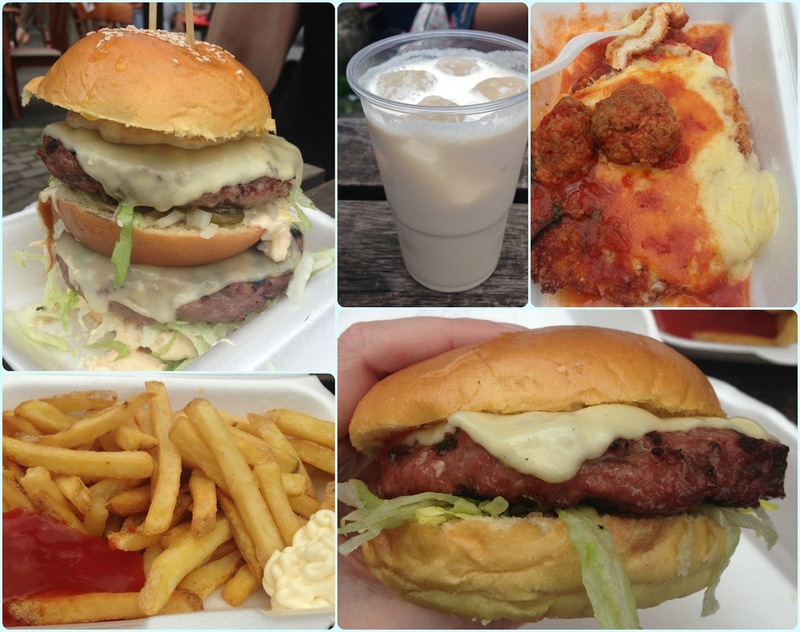 I'd also seen my Twitter friend Sean (@Seanaldo - we chatted about bundts, of course) in the queue for a burger and heard from the other Shaun (@FoodGeekUK), who were both busy mentally preparing for the big challenge. At this point I was just glad that I hadn't been roped into such madness! Round one and they all appeared ok, apart from one poor chap who looked like he had accidentally ended up in this competition whilst looking for the loo. He was in a bad way. Round two was a different story. 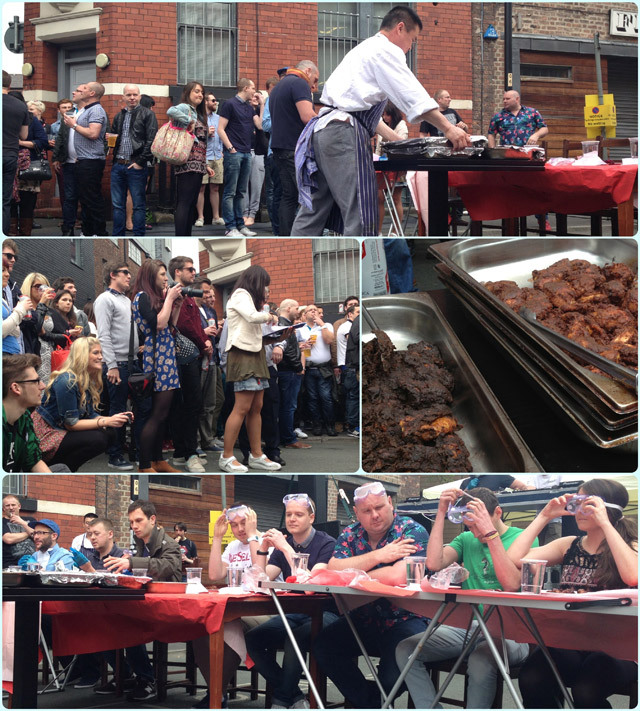 These wings were reportedly worse than round three and saw a few more casualties, including Kev. Mr Hungry Hoss was fairing well until his body decided enough was enough... he valiantly managed to get to a portaloo before rejecting said wings northwards. Good show. Only three remained by the end of round three. It was not pretty folks. Faces covered in sauce and snot, and lips that looked like they had been involved in some horrific accident with a blow torch. The highlight of the day had to be chef Aiden Byrne coming to Sean's snotty rescue with a napkin. And then there were two. I think there was genuine concern at this point that one or both of them may die. They looked like broken men. I thought there may be tears when Franco suggested that if they both drank a shot of chilli vodka that it may be declared a draw. 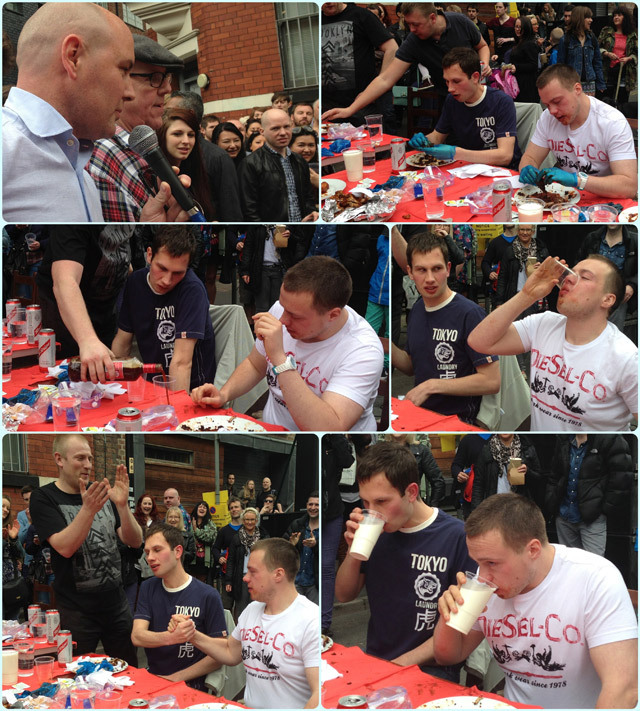 Vodka consumed, both men were victorious! The Shaun/Sean duo had conquered the chillies and (as far as I know) live to fight another day. They must have been chuffing mad. I'm a little concerned for Shaun, as I know he's partial to a bit of fine dining. There is a very real risk that he will never taste food ever again. Another good show from the chaps at Solita. Great food, cracking entertainment and good company. And no-one died. I am so glad I had my Big Manc before hand! It was a really good day, looked like it continued to be in to the night. Looks like fun! Id love to try it! Very Man v Food!